Men dressed in white and wearing ancient tarbooka drums around their necks stand on the edges of the ancient hills of the Shomron. Then, the sound of the shofar breaks the silence and with its blast a pack of runners begin their journey through the lavish orchards, aromatic vineyards and layers of voluptuous greenery that was once – and is still today – the heart of Israel. The event is the Bible Marathon. 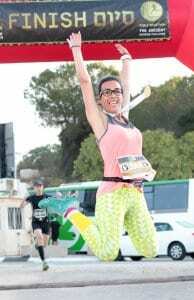 This year, it will take place on Friday, September 28 with the same Israeli flags, balloons and loads of energy that has marked the modern version of this ancient running challenge for the past four years. The full marathon route runs from Rosh Ha’ayin (Eben Ezer in the Bible) to Shiloh, as described in the Book of Samuel. Shortly after the Jews entered the Land of Israel, they fought a battle against the Philistines. This man, from the tribe of Benjamin, ran 42 km. which is also the official length of the Olympic marathon decided upon in 1908 at the London Olympic Games. According to tradition, the Benjamin man was a young King Saul (‎c. 1050 – 1012 B.C.E.). Shiloh was the religious capital of Israel for 369 years, beginning after the conquest of Canaan until King David established Jerusalem as the eternal capital of the Jewish nation. Shiloh, mentioned 34 times in the Tanach, was the longest-standing Jewish capital of any city other than Jerusalem, said David Rubin, a former mayor of Shiloh. In his book, “God, Israel, and Shiloh: Returning to the Land,” Rubin tells the story of the struggles and triumphs of Israel’s complex history, dating back to slavery in Egypt and continuing up to the present, including the period in which the Israelites occupied Shiloh as its capital. Rubin said that Shiloh was a fitting capital for the Israelites when it was established approximately 3,500 years ago by Joshua, son of Nun, for many reasons, including that Joshua was a member of the tribe of Ephraim and Shiloh is in the heart of the Biblical portion of the land allotted to this tribe. Additionally, Shiloh is at the geographic center of the country (approximately 44 kilometers north of Jerusalem), is strategically located in the mountains and, at the time, had a strong and flowing river. At some point during those 369 years, a permanent structure was built for the Ark of the Covenant. Rubin said it is believed that the stone foundation for the Ark can be seen still today at Tel Shiloh, an archaeological dig near the city. Visitors can stand on the spot where it is believed the Ark once stood. The Ark itself was taken into the battle described in the Book of Samuel and captured by the Philistines. The Biblical story of Hannah, who pours her heart out in prayer for a child, takes place in Shiloh. Also, according to Judges 21, Shiloh is where the maidens would dance in the vineyards each year on the 15th day of the Hebrew month of Av, when unmarried men would go there in search of a bride. In the early 1900s, a sportsman by the name of Yosef Yekutieli moved to Israel, then British Mandate Palestine. Yekutieli started the first organized sports competitions in Israel, including the Maccabiah Games. Yekutieli had read the story in the Bible about the Benjamin man and his run from Eben Ezer to Shiloh and he wondered what was the distance, explained Moshe Ronsky, tourism director for the Binyamin Regional Council. Yekutieli for years was left to wonder because the area was under Jordanian control. But, Ronsky said, as soon as Israel won the 1967 Six-day War, Yekutieli hopped into his jeep and drove the ancient and ultimately 42-kilometer Biblical path. Yekutieli re-established the Bible Marathon two years later. However, with the political turmoil and security concerns at the time, “Israel was not equipped to keep the race going.” As such, the Bible Marathon died only a few years later. “We have brought this race back to life,” Ronsky said of the Bible Marathon, which relaunched in its present form in 2015. Last year, more than 2,000 runners from over 10 countries took part in event, which included a half-marathon, 10-kilometer and 5-kilometer races, too. Hermon of Har Bracha wrapped himself in a linen toga for the race. “Wearing the historic garb and thinking about where I am running makes me feel a connection to the land,” Hermon said. Lukasz Wilk, a Christian Zionist who was in Israel with a tour of 100 other like-minded travelers to celebrate the Feast of Tabernacles (Sukkot, in Hebrew), ran the marathon and won. Wilk said he is returning to Israel this year for the Feast of Tabernacles, but he will not be running the race due to injury. Nonetheless, he encouraged others to take part in the Bible Marathon. He said it is especially important for Christians to come to Israel and show their support of the Holy Land, even by walking the 5K. Hermon said that whenever he brings people to Samaria to show them where he lives, he brings along his Bible, “This is our tour book,” Hermon said.